What I’m calling “souvenirs” are just some original sayings I concocted over the years. This is what you get when you spend that much time around cowboys and country people. 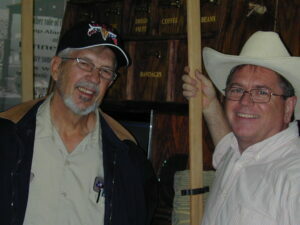 With Joe Roberts, maintenance man at a $5 million roadside rest stop (with a railroad theme, no less!) on U.S. 287 near Estelline, Texas. Joe’s a writer himself. I was doing a travel story and he became my impromptu guide. Some of my most fun moments have come while doing “road” stories. 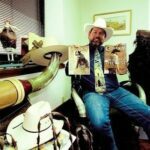 Does the Lord love a cowboy? Well, we know this much: when His Son was born, herdsmen were the first folks He sought out to tell the good news. Most every young fellow has looked into the mirror at one time or another and saw, or hoped he saw, a Western movie hero looking back at him. But what’s a guy to think when, some ways down the trail, he looks into the mirror and sees a sidekick looking back? Does Congeniality outrank Cordiality on the Roll Call of Virtues? And if Consistency is a minor virtue, where does that put mere Punctuality? 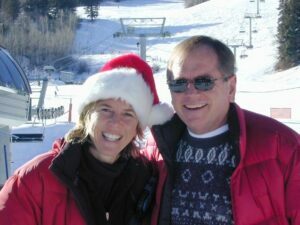 With tennis great Andrea Jaeger on the ski slopes in Aspen, Colo., while working on an article on her ranch for kids suffering with cancer. She and her team took the kids on an outing that day. First you eat it all up. Then you’re all eat up with it. 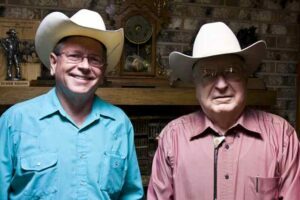 Neighbor, if you haven’t tried it yet, you might want to immerse yourself in the cowboy lifestyle, the most satisfying, salubrious, unscurrilous, scintillating lifestyle that was ever devised by the mind of God, short of being one of His children. And if you haven’t tried that one yet, might as well, and we’ll catch you on the other side. The feedlot cowboy knows well what the Prodigal Son went through when he slopped the livestock amidst the stench, mud, manure, and scenes of misery, after his season of wealth, wine, women, and wantonness. It’s just that the feedlot cowboy didn’t get in on the wealth, wine, women, and all. With bestselling Western novelist Elmer Kelton in his home in San Angelo, Texas, in 2008. One of the recent revelations for me, upon being placed on a strict diet, is that if I want to drink milk, I have to drink skim, or ½ %, milk. Buying that thin stuff is like buying water at $3.50 a gallon. Water that was run through a cow so that a little bit of white would stick to it. And you’re not getting that mountain spring water, at that. You’re getting that water out of the ol’ stock tank. There’s no such thing as old-fashioned virtues. 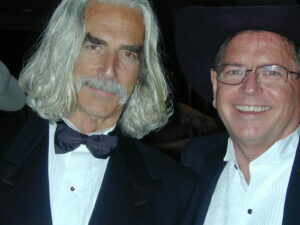 With Sam Elliott shortly after the Western Heritage Awards, when American Cowboy won its Wrangler. There oughta be a law… Take any authentic Western town you want. Any place that has some kind of real Old Western cachet. There will be a clique or claque or klatch of folks there who are bent on turning that burg into Paris, France. Personally, we don’t see the need for anyone to inflict high culture on any Western town. But especially not on those rare towns that have that special something—that aura of historical mystique, or famous-rodeo chic, perhaps. The uplifters in those towns are always right, of course, when they grumble about the persistent “cowtown” or “frontier” image—but it’s because only a dozen or so towns in the whole world can really claim that distinction, and these people happen to live in one of them. Yet those are the towns to which reformers most want to bring the Enlightenment. Look what happened to Santa Fe. Maybe it’s just a matter of not knowing where one is truly needed. Why can’t the culture-bringers go just one town over, to that dusty, culturally challenged little settlement next door where they’d be listened to and left unhindered in their efforts? The place with more bingo halls than lodging establishments. Go there. No, on second thought, leave that alone. Try one of those interstate towns with more lodging establishments than homes. You can spit on your hands and become Lorenzo de Medici. 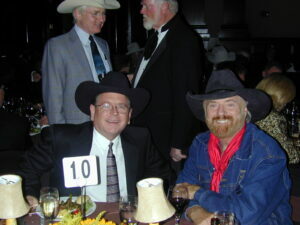 With my friend Michael Martin Murphey at an event in Fort Worth. Murph is a great human being and an inspiration to many. It was Mike Myers and the other “Wayne’s World” dudes of Saturday Night Live who popularized the catchphrase “Not!” in the late 1990s, but we’ve encountered a specimen of that joke that dates from somewhat earlier. Consider these lines, both delivered jokingly, in the boy’s Western adventureComrades of the Saddle, by Frank V. Webster: “He’s a fine neighbor—not.” (p. 145) and “You’re a fine commander to be a lieutenant for—not.” (p. 68). Interestingly, Comrades of the Saddle (Cupples and Leon, New York) was published in 1910. Just goes to show there’s nothing new under the sun. Or rather that there is something new under the sun—not. No segment of society is more steadfast in its advocacy for the virtue of maintaining blessed silence than the cowboy crowd. Perhaps the most succinct expression of that sentiment comes in the old cowboy saying, “Never miss a chance to shut up.” There’s also this, expressed in another old cowboy saying: “No one is as interested in what you’re saying as you are.” Which, when you stop to think about it, is just another way of telling a person to shut up.